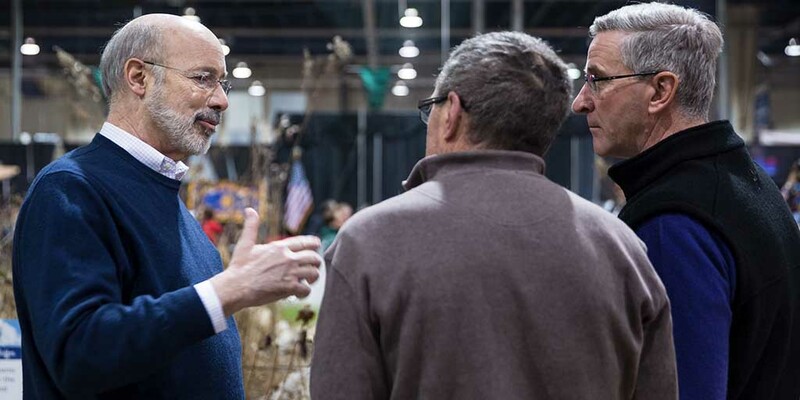 Harrisburg, PA – Speaking to more than 500 state and local officials at the Pennsylvania Farm Show today, Governor Tom Wolf made one point clear: agriculture is an incredibly vital industry to the state’s economy that policymakers and industry must work collaboratively to strengthen and grow. Additionally, working with the General Assembly on a bipartisan basis, the Governor has enacted double-digit-percentage increases in funding for the Department of Agriculture, farmland preservation, and Penn State’s College of Agricultural Sciences. His administration has also implemented historic legislation that has created new markets for farmers, secured new funding for conservation practices, and lowered the tax burdens for agricultural operations. During the luncheon, the Pennsylvania Department of Agriculture unveiled a new economic impact analysis that shows agriculture has a $135.7 billion annual economic impact for the commonwealth and supports nearly 580,000 jobs paying approximately $27 billion in wages. The report also makes strategic recommendations intended to help guide Pennsylvania’s agriculture industry as it navigates and responds to changing demands in the marketplace and policy uncertainty in Washington. “Agriculture is at a critical intersection as an industry,” said state Agriculture Secretary Russell Redding. “The interplay of changing consumer preferences, increasing competition, and policy uncertainty require us to be exceptional storytellers. We must articulate our value to — and our role in — the commonwealth. This economic impact analysis gives us an additional tool to tell that story. “At the same time, we must be mindful of how the landscape is changing. We must look ahead and prepare for how to manage the complexities of the world around us. This report seeks to do that, as well,” added Redding. The report makes a series of recommendations under six categories: capitalize on branding and marketing opportunities; expand agricultural infrastructure, such as processing and manufacturing capacities; continue improving the state’s regulatory processes and business climate; broaden workforce development and education opportunities; make additional investments in infrastructure systems, such as transportation and broadband; and diversify product lines to strengthen markets and improve resiliency. For more information on the Wolf administration’s work to strengthen Pennsylvania agriculture, visit agriculture.pa.gov.